Description: 4PRO - 4.3" Super-bright LCD fishfinder with dual-channel CHIRP DownVision™ sonar and chartplotter. No charts included. Description: 4PRO - 4.3" Super-bright LCD fishfinder with dual-channel CHIRP DownVision™ sonar and chartplotter. C-MAP Rest of World charts. Description: 4PRO - 4.3" Super-bright LCD fishfinder with dual-channel CHIRP DownVision™ sonar and chartplotter. C-MAP US Essentials Charts. Description: 4PRO - 4.3" Super-bright LCD fishfinder with dual-channel CHIRP DownVision™ sonar and chartplotter. Navionics+ North America Gold Charts. *Open Box and Reconditioned items may come from customer returns or may have been opened for quality testing, or in some cases the packaging might be blemished. All products carry our full manufacturer's warranty and get new packaging as needed. See the real world below with the Dragonfly 4PRO. Our most affordable Dragonfly display; the Dragonfly 4PRO with dual-channel CHIRP DownVision and Fish-Targeting Sonar, bring serious sonar technology in reach of every angler. 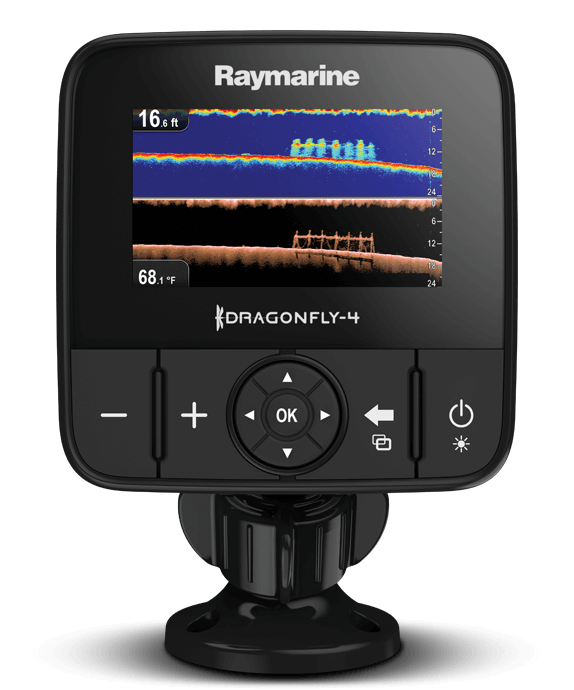 With advanced technologies including wide spectrum CHIRP DownVision™ and all weather optically bonded displays; Dragonfly sonars let you spend more time catching fish and less time looking for them. "); olark.configure("locale.chatting_title", "Now Chatting"); olark.configure("locale.unavailable_title", "Live Help: Offline"); olark.configure("locale.away_message", "Our live support feature is currently offline, Please try again later. "); olark.configure("locale.loading_title", "Loading Olark..."); olark.configure("locale.welcome_message", "Thanks for visiting! Please let us know if we can be of assistance. "); olark.configure("locale.chat_input_text", "Type here and hit to chat"); olark.configure("locale.name_input_text", " and type your Name"); olark.configure("locale.email_input_text", " and type your Email"); olark.configure("locale.offline_note_message", "We are offline, send us a message"); olark.configure("locale.send_button_text", "Send"); olark.configure("locale.offline_note_thankyou_text", "Thank you for your message. We will get back to you as soon as we can. "); olark.configure("locale.offline_note_error_text", "You must complete all fields and specify a valid email address"); olark.configure("locale.offline_note_sending_text", "Sending..."); olark.configure("locale.operator_is_typing_text", "is typing..."); olark.configure("locale.operator_has_stopped_typing_text", "has stopped typing"); olark.configure("locale.introduction_error_text", "Please leave a name and email address so we can contact you in case we get disconnected"); olark.configure("locale.introduction_messages", "Hi, I am around, click 'start chatting' to contact me. "); olark.configure("locale.introduction_submit_button_text", "Click here to start chatting"); olark.configure("locale.disabled_input_text_when_convo_has_ended", "chat ended, refresh for new chat"); olark.configure("locale.disabled_panel_text_when_convo_has_ended", "This conversation has ended, but all you need to do is refresh the page to start a new one! "); olark.configure("locale.welcome_message", "Thanks for visiting!